Another gray Saturday morning -- I wanted to sleep in late but dragged myself out of bed. A dozen riders headed out of Salem this morning under dark and cloudy skies. 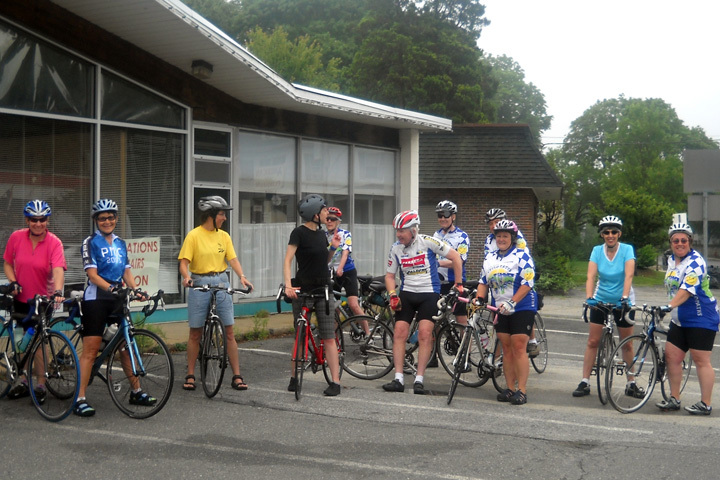 We rode a quick pace through Beverly and Wenham to Ipswich, largely sticking together on the trip to breakfast. The food at Stone Soup was excellent, as always. Definitely worth the trip! Heading home, we took the backroads of Ipswich and Wenham back to Salem. The sun (which burned through the fog while we were at breakfast), gave us a nice, warm ride back, though the humidity was high. Fortunately, there were a few breezes and enough scattered clouds to make it a great ride. Total Mileage: 35. I love summer!